Kershaw Alaskan Blade Trader. Maximum overall length is 11". 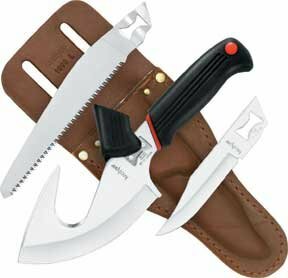 Interchangeable 3 1/2" 420 J2 stainless clip point hunting blade, 6" high carbon steel wide tooth saw blade and 6" AUS-6A stainless guthook blade. Black task force rubber handle with red trim. Features a quick lock mechanism in the handle that leaves the entire blade useable. Brown leather harness belt sheath holds extra blades.